The Campus Notebook Backpack is ideal for students at school or university and also appeals to today's mobile professionals with an active lifestyle and a more casual work environment. The padded computer compartment is specifically designed to protect laptops with standard 15 - 16 inch screens. There's plenty of storage space: an extra large zippered storage compartment with internal pockets including zippered mesh pockets - perfect for personal (iPod, CD player, PDA, etc.) 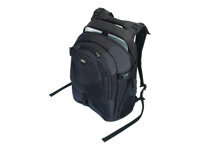 or computing accessories.Other features include pen loops and student / business card holder. Finally, for your ultimate carrying comfort, there's a 3D contoured air-mesh back padding which helps alleviate stress and strain on your back.